Used with one hand when measuring the distance between two points on a chart. 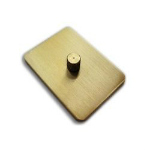 8″ Single Brass Divider is able to be used with one hand when measuring the distance between two points on a chart. Made from solid brass, this kind of divider is a must have for chart reading work. The CEVNI playing card size flip cards provide a very easy learning platform and are ideal for swatting up on CEVNI signs and symbols.